In short, a 10×10 kitchen is an “L” shaped kitchen that measures 10-foot by 10-foot. This is an industry standard used to determine how many cabinets you need and how much it will cost. 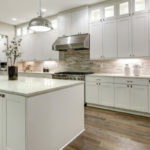 In reality, very few kitchens actually match up to an exact 10×10 kitchen, but that doesn’t mean it isn’t a useful tool to figure out estimates for your kitchen. Once you start shopping cabinets you will find that estimates for cabinets are often given regarding a 10×10 kitchen. 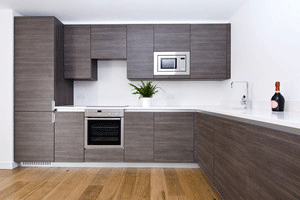 This sample size kitchen provides an easy way to compare pricing of cabinetry. This industry standard does not include the cost of molding, decorative hardware, appliances and so forth, instead its strictly focused on cabinets. 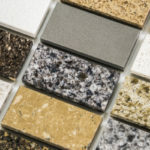 Considering cabinets are one of the more complex and costly portions of any kitchen remodel, this sample size is a very useful tool. Many companies, designers and other industry professionals will use 10×10 kitchen references to quote prices for cabinets. If you hear someone using this terminology you can take advantage by knowing exactly what he or she is talking about. 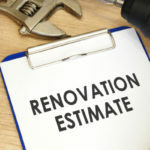 This will help you better plan for overall kitchen remolding costs. How Many Cabinets Are In A 10×10 Kitchen? A standard 10×10 kitchen model includes 12 cabinets, two are exactly the same size and the other 10 are of different sizes. These 12 cabinets are always the same assortment of sizes in every model, ranging in size from 36” by 30” wall cabinets, to 18” wide base cabinets. It’s not unheard of for a company to advertise a much lower price for cabinetry needed to fill a 10×10 kitchen, but if they claim only 10 or 11 cabinets go in the space, they are not using the actual industry scale. In most cases this is because they are trying to make their prices appear cheaper than the competition when in fact they are not. Hence why it’s so important to know that a 10×10 kitchen should always include 12 cabinets. Always ask what a company is basing their estimates off of, or rather how many cabinets go in a 10×10 model to ensure you’re not getting tricked. What Does This Mean For Your Remodel? If you are going with standard kitchen cabinets this will help you to determine the cost of your cabinets. Depending on the type of cabinets you select, including the materials, styles and so forth, you can use this model to check price differences. For instance, if you have your eyes on mahogany maple cabinets but the price is a bit high, it’s much easier to find out the price for maple vs. a different type of wood cabinets in regards to the 12×12 model. On the other hand, it’s impossible to expect anyone to have the exact cost breakdown for your particular kitchen. If a 12×12 kitchen with Mahogany Maple costs $2,200, you divide this number by 12 to get the cost per cabinet. Once you know what each cabinet costs it’s easier to do the math and find out how much the same cabinets cost to fill up your kitchen. While this doesn’t provide 100% accuracy it does help provide an easier way to estimate the cost of different cabinet materials and styles. As a result, you have a quick way of estimating costs to see if they are in line with your budget. 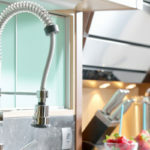 Of course, the best way to get a solid estimate is to hire a kitchen designer to assess your kitchen and your wish list. Tops Kitchen Cabinet is more than happy to help you find the perfect cabinets, countertops and more to create the kitchen of your dreams.